This paper summarizes the current state of Cuban networks and discusses some of the potential, marginal impacts of those networks. We summarize the state of four networks with international connections. While much smaller and less powerful than networks in developed nations like the United States, they have grown substantially since 1992 and are significant relative to other Caribbean nations. We also discuss the possible marginal impact of improved networks on various policy goals, and conclude that, in spite of costs, the improvement of Cuban networks would be desirable. There are four Cuban networks with international Internet connectivity: CENIAI, Tinored, CIGBnet, and InfoMed. 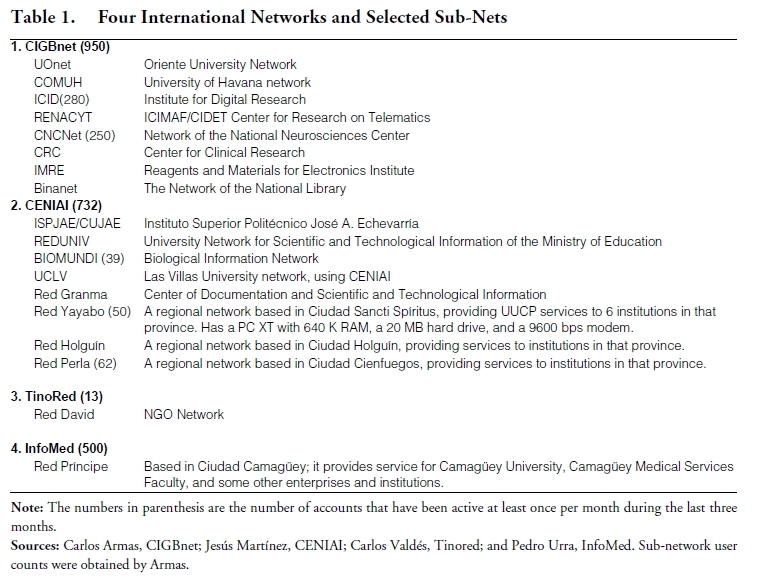 CENIAI, the Center for Automated Interchange of Information of the Cuban Academy of Sciences, began networking in 1982, and has had a dial-up link to the Internet since 1991. They currently offer email, database access, mail lists, and programming and consulting services, and maintain a presence on a Gopher server located in Uruguay. Tinored (Tino Network— Tino, a Cuban cartoon character, is the logo, and “red” means “network”) was established by the Cuban Youth Computer Clubs, an organization with explicit support of Fidel Castro, that operates 150 walkin computer centers throughout the nation . One hundred of these have Tinored email accounts, and approximately 80 have working (2400 bits per second, bps) modems. Tinored is also a gateway for Red David, which supports at least 31 NGOs. CIGBnet is the network of the Center for Genetic Engineering and Biotechnology and affiliated institutions . They have a central site in Havana and three remote sites. CIGBnet began in 1991 and has grown to 900 users. They provide email, database access, a biological sequence server, mailing lists, and Gopher and Web servers (accessible only from the main center). CIGB staff have developed their own mail-based database server, off-line mail package, and sequencing server software, and they are continuing such work. InfoMed, the network of the National System of Health Information of the Cuban Ministry of Health, has been operating since 1992. They have 500 accounts, 80% of which are shared by more than one person within an organization, and provide email, discussion groups, file retrieval, database search, and consultation. While they currently operate a single node in Havana, they are building a distributed network with 13 servers in Cuban medical schools with support from the Pan American Health Organization and UNESCO. Table 1 summarizes these and the more important subnetworks they serve. For more information on these networks, see [14 and 15]. Note that these networks are not the equivalent of regional or even campus networks in the U.S. or other developed nations. While U.S. networks are permanently connected to the Internet, Cuban networks connect temporarily. For example, 4-6 times a day a call is placed from an Internet access provider in Canada to CENIAI in Cuba. When the connection is established, batches of waiting email messages are transferred in both directions, and the connection is dropped. This means that Cubans and outsiders can exchange email with only a few hours delay, but interactive activity like browsing the World Wide Web is not possible. Interactive Internet access to and from Cuba would require permanent international circuits and use of communication software implementing the Internet Protocol (IP). Most, though not all, intranational traffic is handled in the same manner as international traffic. This means most Cuban users can only exchange email or query databases by emailing commands within the nation. However, technicians at several centers are experimenting with intranational IP connections. As such, they are gaining experience for the time when Cuba has international IP connectivity. The computers comprising the Cuban networks are also small by U.S. standards. They are typically 386 or 486-based PCs. Although several years out of date, they are still sufficient for a meaningful email network. A single computer may also be shared by several users. In spite of difficult economic conditions in recent years, Cuban networks have grown substantially since 1992 . Cuban authorities are well aware of these networks and they require hard currency for hardware, therefore it seems the government supports them. This support has brought Cuban networks to the point where they are significant by Caribbean standards. It appears that the number of users in Cuba is greater than the rest of the Caribbean nations combined, and international traffic is over 37% of the rest of the Caribbean . Cuba has developed a sizable user community, with networking skills and applications. This has grown out of a long-standing commitment to education throughout the society, and major research, development, and therapy programs in biotechnology and medicine. Cuban networking experts have the expertise to operate an international IP link, and permission of the government to do so. They are missing funding and a working agreement or plan for cooperation between the various networks, but these will be achieved. CENIAI has had a proposal to establish a leased, IP link to the Internet for several years, and a commission was recently established to oversee this process. At the same time, it was announced that users would be registered and access controlled. Cuba, like other repressive nations, faces the dictator’s dilemma— they fear the political affects of open access to information and communication (inter and intranationally), but desire the economic benefits of networks. The Cuban Democracy Act sets forth a number of goals for U.S.-Cuban policy. This section delineates these and several other goals, and discusses possible marginal impact of improved communication and networking on each. The Cuban Democracy Act calls for “free and fair elections” in which all candidates are permitted “full access to the media.” While the Cuban government currently shows no inclination to hold free elections, they will occur at some time, and at that time, an improved communication infrastructure would be an asset for all political parties. In general, one would expect networks to encourage democracy by providing Cubans with outside information and ideas, and by enabling them to share ideas and coordinate activity, much as the Internet was used for inter and intranational communication during the failed Soviet Coup attempt . The Internet also carried news and discussion of events in Tiananmen Square, Chiapas, etc. 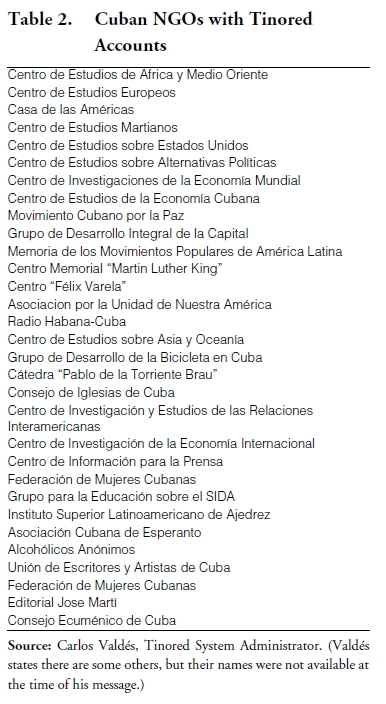 The Cuban Democracy Act calls for the Cuban government to show “respect for the basic civil liberties and human rights of the citizens of Cuba,” and authorizes the U.S. Government to “provide assistance, through appropriate NGOs, for the support of individuals and organizations to promote nonviolent democratic change in Cuba.” 1 At least 31 NGOs have accounts on Cuban networks (see Table 2). Are Cuba’s NGOs government puppets or seeds of civil society? The answer is ideologically and intellectually unsatisfying. They are both, though the latter characteristic is very gradually growing. In a September, 1995 interview, Gunn stated that since the Spring of 1993, there have been Cuban government memos stating there are too many NGOs, and calling for increased audit and control by the ministry which oversees them. Subsequently, Raúl Castro has commented on Gunn’s report, suggesting that NGOs are a threat. Gunn feels email is a lifeline for the NGOs since fax and telephone are unreliable and expensive. For instance, the Georgetown University Cuba Project, which she directs, is organizing an environmental conference with two Cuban NGOs, which would have been impossible without email. I had the same experience as chairman of the 1994 Conference on The Impact of Informatics on Developing Countries, of the International Federation of Information Processing Societies in Havana, which would have been impossible without the network, as would be the paper you are now reading. The Cuban Democracy Act calls for movement toward “establishing a free market economic system,” and there has been some movement in this direction, including dollar legalization, limited markets, and, most recently, a liberalization of investment laws. In a communication-poor nation, a computer network can make a meaningful contribution to a market economy. Again, the Relcom Network, which carried commercial traffic from its inception, provides an example of this role. A market economy also requires private capital, and a robust communication system is an asset in the eyes of a potential investor. While this is not an explicit goal of U.S. policy, it is consistent with the humanitarian ends our policy seeks to achieve. Cubans point with justified pride to significant gains in racial equality, health care, education and science, and improved life in rural communities, as achievements of the Castro regime. As Table 3 shows, Cuban basic indicators are comparable to successful South and Central American nations Chile and Costa Rica which have reached satisfactory levels of economic growth and addressed the basic needs of their populations. One can argue that historical conditions and policies of pre-Castro Cuba are responsible for some of Cuba’s success, or that there were alternative means of reaching the same end, but there have been major accomplishments which should be preserved and extended. To the extent that improved telecommunications will help the Cuban economy recover from its current crisis, it will help provide the stability and economic surplus necessary to continue social programs. Additionally, improved telecommunications can bring some of the economic, educational, and cultural advantages historically enjoyed in cities to the country side. Many in the U.S. argue that cutting Cuban living standards destabilizes the government, and will lead to change; however, this is achieved at great humanitarian cost. It also increases the danger of a violent revolution, with attendant loss of life, economic ruin, refugees, and political-economic responsibility for the U.S. . For pragmatic and humanitarian reasons, we would surely prefer a peaceful, democratic transition as exemplified by the Chilean elections to a violent change. U.S. policy has been to pressure the Cuban government by stopping foreign investment. While we have slowed foreign investment, we have not stopped it. Pérez-López [9, 10] discusses the quality, quantity, strategic value, and other aspects of foreign joint ventures in Cuba. He reports that the number of joint ventures has grown from fewer than 20 at the end of 1990 to about 60 at the end of 1991, 76 in November 1992, 180 at the end of 1994, and 230 by May 1995 . (On the other hand, he reports that that these investments are often worth less than their reported face value .) 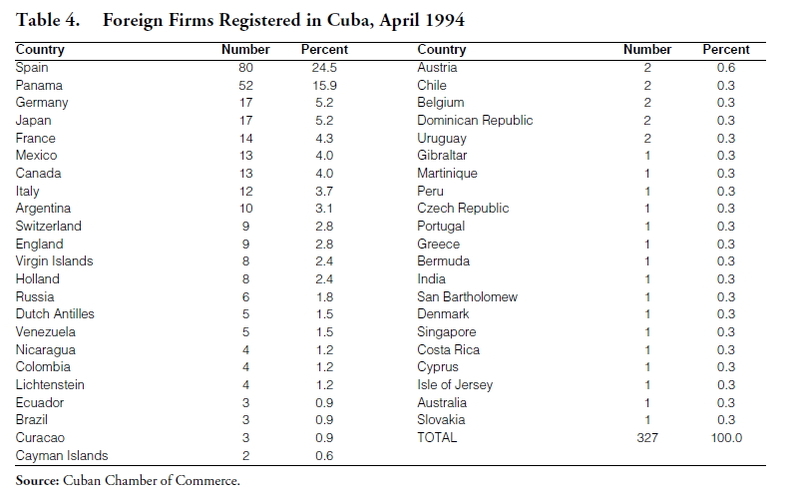 Further evidence of foreign business and investment is provided by Table 4, showing the number of businesses with Cuban offices by nation. While designed to precipitate change, our policy has had the undesirable side effect of reducing U.S. business opportunity. Prior to the passage of the Helms Burton Act it was arguable that network-related investment was consistent with the Cuban Democracy Act. This no longer appears to be the case, but if and when it again becomes legal, it would have destabilizing effects and provide opportunity to U.S. business. While trade is illegal today, one day trade relations will be established, and good communication infrastructure will be of value. Humanity has experimented broadly during the 20th century. We have learned that a central, planned economy is less efficient than a market economy at the production of goods and services, and can inflict catastrophic environmental damage and lead to arbitrary and capricious distribution of income and power. While relatively efficient, market economies also inflict environmental damage and lead to wide variance in the distribution of income and wealth, with attendant human and moral cost. These concerns are widely held, as witnessed, for example, in the NAFTA debates in the U.S. Congress or the Pope’s recent U. N. speech. Transitions like those in Eastern Europe and Cuba may provide the opportunity for further experimentation and variety in management and state/enterprise relationships. For example, the recent law liberalizing foreign investment in Cuba allows the investor to own an enterprise and its capital assets, but the employees work for the state. It will be interesting to see the results of this arrangement over time. A robust communication infrastructure would help create the environment needed for new forms of organization to evolve and would also be used by these organizations. While only one component of that environment, it is significant. The current economic crisis has caused Cuba to cut energy consumption. This has caused hardship, but also conservation, rationing, reengineering and substitution— for example in the large scale use of bicycles. To the extent that communication can be traded for transportation in the economy and education systems, an improved communication infrastructure may be seen as making a contribution to efficiency and preservation of the Cuban environment. Discussion of communication networks in developing nations often centers on the advantages to the developing nation of gaining access to information and experts in developed nations; however, this is a twoway street. For example, Cuba has strong biomedical research and therapy programs, and improved communication will facilitate access to Cuban databases and experts. Cuban science will also benefit from contact with colleagues internationally, to the advantage of all mankind. The improvement of Cuban biomedical science and access to its results would be to the humanitarian benefit of Cubans and all others, particularly Latin Americans who make use of Cuban health resources. Cuba also has information resources in other fields, for example, the digitized Havana Art Museum collection or Spanish-language educational software. On balance, I would argue in favor of a policy which facilitates the improvement of Cuban computer networks and the infrastructure needed to support them. Such communication would further a number of U.S. goals, such as free elections and respect for human rights. It would also have economic benefit for Cuba, which would be of humanitarian value, but would be counter to the strategy of trying to force Cuba to capitulate and oust Castro. This is the U.S. policy dilemma. Fidel Castro and the Cuban Government also face the dictator’s dilemma. Communication technology is an important resource for economic growth , yet it opens the door for freedom of internal and external expression which could threaten the regime. Some governments have chosen to suppress information technology regardless of the economic cost , but as we have seen, Cuba is more positive toward computer networks. In the current energy and economic crisis, communication is difficult in Cuba. The obsolete telephone infrastructure is deteriorating, paper, copier toner and other supplies are very difficult to find, and television broadcast schedules have been cut. Computer networks may partially fill these voids, making them a low-cost investment with a high marginal return. Armas, Carlos, “Cuba,” in the Eye on Developing Nations section, OnTheInternet (July/August 1995), pp 38-39. Goodman, S., and Green, J. D., “Computing in the Middle East,” Communications of the ACM, Vol 35, No 8 (August 1992), pp 21-25. Kedzie, Christopher R., “Coincident Revolutions,” OnTheInternet, in press. Martínez, Jesús, “Profile of the Cuban Scientific Network Project,” email document, February 1995. Pérez-López, Jorge F., “Islands of Capitalism in an Ocean of Socialism: Joint Ventures in Cuba’s Development Strategy,” in Pérez-López, Jorge F., ed., Cuba at a Crossroads. Gainesville: University of Florida Press, 1994, pp 190-219. Press, L., “Technetronic Education: Answers on the Cultural Horizon,” Communications of the ACM, Vol. 36, No. 5 (May 1993), pp. 17-22. Press, L., and Armas, C., “Cuban Network Update,” OnTheInternet (January/February 1996), pp 46-49. Wellenuius, Bjorn and others, Telecommunications: The World Bank Experience and Strategy, Discussion Paper # 192. Washington, D.C.: The World Bank, March 1993.